The famous manta ray night dive in Kona is widely regarded as one of the most memorable dives around the planet. We agree with the experts and think that swimming with the manta rays is one of the Big Island activities that you shouldn’t miss. This guide is structured as follows: we first explain why we think that swimming with the manta rays is such a memorable experience. 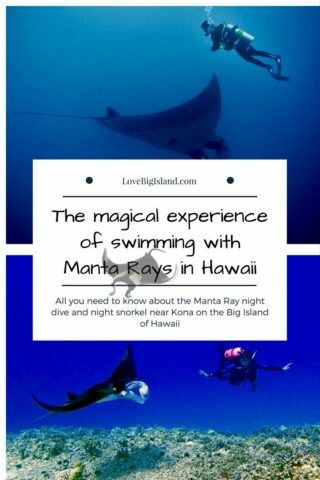 Once that is out of the way we give you a complete overview of the different ways in which you can experience the manta rays on the Big Island. Why is the Kona manta ray dive/snorkel so special? Q: What is the difference between the night snorkel and night dive? Q: What happens when you don’t see any manta rays on a tour? What are the Kona Manta Rays like? The manta rays that live in the Hawaiian waters belong to the Manta alfredi species. These so-called reef manta rays are the second largest species of manta rays in the world, and can grow up to a wingspan of 18 ft (5.5m)! On average, the manta rays you can see around Kona will be about 12 ft.
Manta rays eat plankton which they filter out of the water by swimming with their (giant) mouths open. The reef manta rays in Hawaii do not migrate and spend their lives in the coastal waters around the islands. Manta rays can live to be 50 years old, and all of the specimens in the Kona waters have been given their own name. What makes the Manta ray dive/snorkel in Kona so special? Hawai’i is not the only place where you can swim with manta rays. Other popular places to dive with these gentle giants are for example the Maldives, the Great Barrier Reef, and the Galapagos islands. Most manta ray dives at these locations are made at so-called “cleaning stations”, where the manta rays get their skin cleaned by smaller creatures (more information). What makes Hawaii so special is the time when you are in the water with the manta rays: dinner time! Diving with mantas is one of the most satisfying things a person can do in the water. It’s impossible to describe the feeling of watching a massive fish the shape of a stealth bomber coming into vision. It’s akin to watching your child ride a bike for the first time or finding a winning lottery ticket. In fact, I often use the phrase ‘like watching a manta ray swim by’ as a way to describe the feeling of something awesome. Samuel Beckett – Planet Dive. The 3 locations where you can see the manta rays at the Big Island are so-called “feeding stations”. The manta rays first started coming to these places to eat the plankton that was attracted by bright lights that shone on the water either from hotels or from divers. Nowadays the plankton also gets attracted by lights brought by tour operators. Divers carry a light and shine it up towards the surface, and snorkelers hold on to a float with a light that shines down. The manta rays feed on the plankton attracted by these lights and filter it out of the ocean by swooping through the water with their mouths open. While feeding the manta rays swim, turn, and somersault gracefully in the light beams giving you an unforgettable night! Two Manta Rays Feeding At Night off Kona, Hawaii. Image credit: wikipedia. Swimming with the Manta rays is possible both while snorkeling and while diving. If you want to see the manta rays from land your best chances lie in a visit to the manta learning center. Tour operators in Hawai’i operate under strict and self-enforced standards. This is necessary to protect the manta rays and we urge you to choose a tour provider that follows these standards. You can find an up-to-date list of these tour operators in the following green list. What is it like to go on a manta ray night dive/snorkel? Manta ray tours normally start at the harbor from which the boat departs. This boat will take you to one of the manta ray feeding zones. Before boarding or during your trip to the feeding grounds the crew will teach you how to behave while in the water and explain you a thing or two about the manta rays. 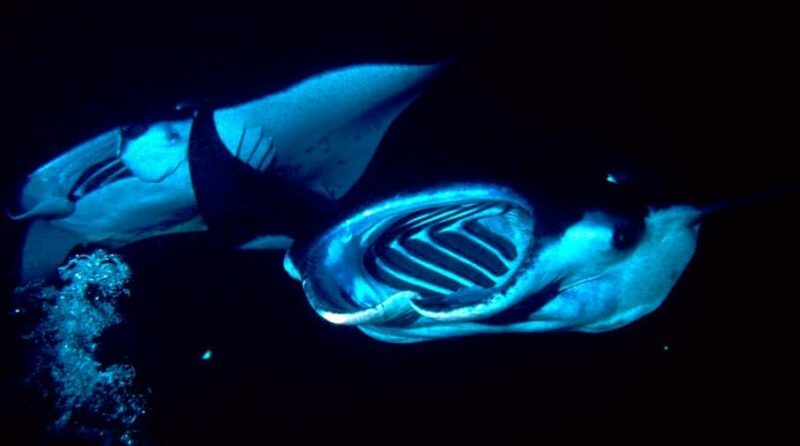 You can get an impression of how it is to go on a manta ray night dive from the following video. In it, you see Keller Laros (founder of the Manta Pacific Research Foundation) give a presentation on how to behave during the dive to a group of people about to go diving. The last few minutes show footage of that same manta ray dive. Pro tip: make your reservations for this activity in time. The manta ray dive is so popular that the manta ray dive and snorkel tours tend to get fully booked, even a couple of days in advance. During the manta ray night dive you will spend most of your time sitting on the ocean floor while the manta rays feed in the water above you. Manta rays can come as close to you as a nose-length during the night dive. You need to be a certified scuba diver to join the manta ray night dive. There are many companies on the Kona coast that take you out at night on the manta ray dives. Walk around town (Ali’i drive in Kona!) to find special offers, use a price comparison website like hawaiiactivities1, or have a look at e.g. 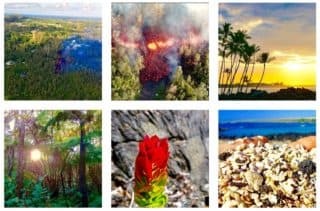 the website of Big Island Divers. During the manta ray night snorkel you will spend your time in the water holding onto a floating board looking down. The bright light also attached to this board shines down into the water attracting plankton. The manta rays feed this plankton and come very close to the water surface while feeding. It is not possible to do “free snorkeling” during the tour because your snorkel and fins can hurt the manta rays. Touching them can remove their protective skin coating and the mantas will likely leave if touched. Aside: what is the difference between the manta ray night dive and night snorkel? The biggest difference between the night dive and the night snorkel is location. If you go on a snorkeling tour you will stay near the water surface, probably holding on to a flotation device that also has lights attached to it to attract plankton and thus the manta rays. If you go on a diving tour you will be sitting o the ocean floor close and see the manta rays looking up. The difference is nicely illustrated in the following video which was filmed during a manta ray night dive in Kona. In it you can see the divers sitting on the ocean floor looking up while the manta rays are swirling around to eat the plankton. On the water surface you can see stagnant and floating lights on the water surface. This is where the people snorkeling are looking down to the manta rays. What happens when no manta rays show up on a tour? It is impossible for manta ray tour operators to guarantee manta rays sightings every night of the year. It is possible that you are unlucky and join a manta ray night dive/snorkel without seeing a single manta ray. If this happens it is standard practice for the tour operators to either re-book you free of charge or to give a large discount for a tour one of the following nights. However, you should check these conditions for yourself before booking. This means that it is wise to plan your manta ray night dive early during your stay so that you can reschedule your tour without running into too many conflicts with the rest of your itinerary. This is the original manta ray night dive location. Manta village is located off the coast in from of the Sheraton Keauhou Bay Resort & Spa in Keauhou, about 7 miles south of Kona. It is the location with the highest success rate in manta ray sightings. In 2013, for example, a staggering 96% of all manta ray tours reported seeing manta rays, with an average of 4 manta rays/night (source). There are a few local operators (such as Sea Paradise) that operate from the nearby Keauhou Bay to reach this site. This cuts down travel time down from 45+ minutes to only a few, which is great for those of you prone to sea sickness and also means you will be exposed to the elements shorted after being submerged in the ocean at night for 45 min to an hour (it can get cold at night on the ocean). Manta village is located offshore of the Sheraton Kona resort at Keauhou Bay. Image credit: google maps. This site is located offshore of the Kona International Airport, about 8 miles north of Kona. Manta heaven is a very popular spot for daylight dives, and is also known as “Garden Eel Cove”. Of course, this spot is also known for the manta ray night dives. The success rate at manta heaven is a bit lower than that at the manta village location but is with 90% still very high. The big selling point for this location is the number of manta rays you can see. The average amount of manta rays seen here per night in 2013 was 11, compared to ‘only’ 4 at manta village. Manta heaven is located offshore of Kona International Airport. Image credit: google maps. This is the most northern location on the Big Island to see the manta rays. It is located close to Waikoloa village and the Kohala resorts, near the Kawaihae harbor. The main selling point for this manta ray night dive spot is the lack of other tourists. At the other two locations (manta village and manta heaven) it can happen that you are in the water with 50 to 100 other people. That will never happen here, and sometimes the group that you are with is the only one in the water. The reason for this is also the disadvantage of this location: there are fewer manta rays and they are seen here less frequent that at the other two locations. The manta learning center is a 700 square ft space within the Sheraton Kona resort. In the manta learning center you can see beautiful manta ray photos, as well as general information about manta ray anatomy, life cycle and feeding, reproductive and behavioral patterns. There is also a 15-minute video display showing fmootage shot during manta ray night dives, and every day at 6 pm you can listen to a presentation about manta rays. There is also a manta ray viewing area close by where you can see the bay in which the manta rays swim. You can see manta rays from this viewing area with some luck.